what does that big line mean? The one on the far left? That's an integral sign. You'll learn about it if you take a math class on calculus. It can mean either finding the antiderivative of a function, or, as in this case, finding the area under the graph of a function. For more info, and probably a better explanation on what an integral is, see Wikipidia's entry on integrals. For anyone who is interested, this integral is so important that it has it's own name, the Gaussian Integral, and a proof of it can also be found on Wikipedia. I have pi memorised to 362 places. Pi is infinite (I've read books on it! ), it can't end. You can't say 'x' = pi, because we don't know what pi fully is. Sure, you can say x = 3.14, but that's nothing spectacular - it proves nothing. You can't say that x = pi, because pi never ends. Ever. Anyone know of the Riemann hypothesis? Prime numbers are more intricate than you may think! Shouldn't be too hard for any of you to understand. This is the major flaw in your proposal. Essentially, you are letting x = π. That means that the equation x = (π + 3) / 2 is incomplete. If π=x, then you should not have both x and π in your equation. You need to finish your substitution of x for π. (4/3z) is supposed to mean 4/(3z) or (4/3)z ? (1/a+z) is (1/a)+z or 1/(a+z)? Ok i'll take it a bit further! If ab=1 then 2/6<0<3/6 which is wrong! Its just an excersise i found a few days ago, tried solving it and failed miserably . Eh, no. Leave it to the math freak. I have not found the value of x, I have "found" the value of pi. Essentially I haven't, because the first equation is completely correct; I simply made incorrect transformations in the process to "prove" that pi was 3. Basically, I have incorrectly elmininated our unknown variable x. You see, I can make whatever statement mathematically to assign (or in this case, correlate) the variable x. pi in this case is some constant. The incorrect part lies when I take the square root out of both sides of the equation; the value within the paranthesis may as well be it's negative correspondance; and when you actually add that, you don't get pi = 3 anymore. It may as well be x-pi = +-(x-3). Alright, if you still want to argue about it, try replacing pi with "4" everywhere in the "proof". The first equation will be correct, yet the end result (that 4=3) will trivially be incorrect. Where does he ever say that π=x? Hi, I'm studying Statistics 1 and I'm stuck on a question on Discrete Random Variables. I have the question and the answer from the mark scheme but I don't understand how they answered it. If anyone can please explain what I have to do, to answer it would be greatly appreciated. The first table shows the probablity that x is smaller than or equal to a certain value. The second table will show the probablity that x is precicely equal to a certain value. Starting with the first entry, from the first table we see that the probablity that x is smaller than or equal to 1 is 0.1. The question then is, what is the probablity that x is precicely 1? 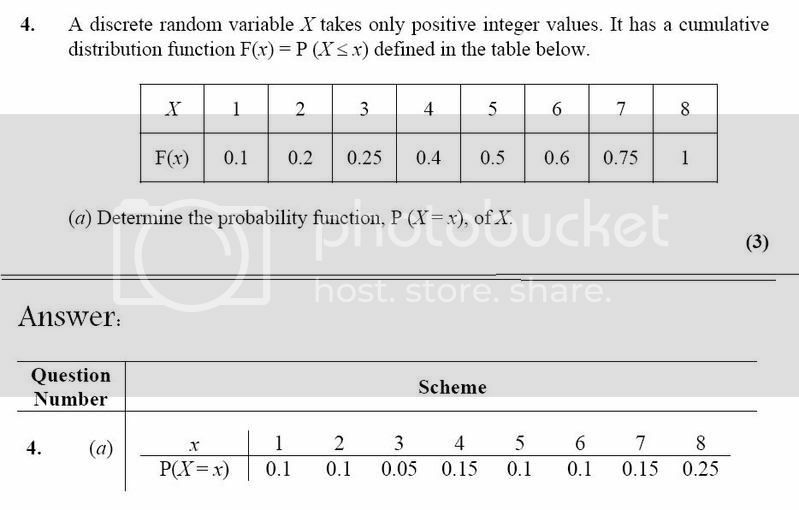 Since the probablity that x is smaller than 1 is 0 (1 is the lowest value it can take) the probability that x is precicely 1 must also equal 0.1.
and we see that the probability that x is precicely 2, and thus the second entry in the solution table, is 0.1.
and thus (probability that x is precicely 3) = 0.05 - this is the third entry in the solution table. For the rest, the same general pattern (which I've hopefully made clear by now) is followed. Hope this helps. Mag, . (3) = .33333333..., it's just a different notation.